Welcome to the Darth Revan mods guide, the latest article in a series about Star Wars Galaxy of Heroes where we take a look at the best mods for individual characters. While I do not claim to have all of the answers in this game, I do my research and have used every toon I write about extensively, and Darth Revan is one character I have used a lot. These are mod recommendations based on the character’s kit and actual gameplay to help you in your quest to dominate the Galaxy of Heroes holotables. Main Focus: Speed. I cannot emphasize enough how important Speed is for Darth Revan. Mine is over 300 and I am still not getting to go first in many battles, but because I have an extremely fast Sith Assassin and BSF I am able to survive most of my Arena enemies’ initial attacks. My recommendation is a Speed set (4 speed mods) all with extremely high Speed secondaries (the best you have) and then the fastest set of two mods you can get for the second mod set. Additional Areas to Focus: After Speed, Offense, Critical Chance, Critical Damage, Potency and survivability. 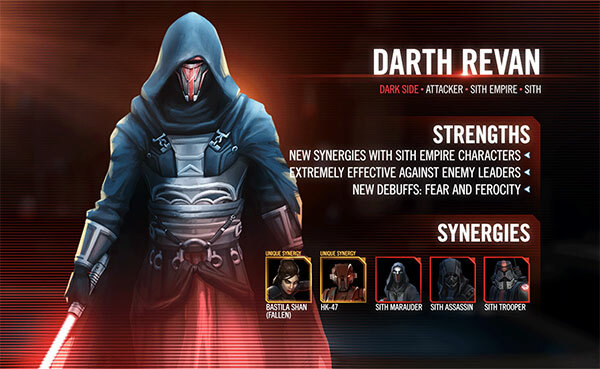 While Darth Revan’s kit calls for Potency to enhance his ability to apply debuffs, his Force Storm special applies 5 stacks of the Ferocity debuff to Sith Empire allies which reads in-game as “-15% Defense and Tenacity per stack, +8% Offense and Potency per stack.” Thus, a single application of 5 stacks of Ferocity means +40% Offense and Potency on the character which shows why we do not want to focus too heavily on this important stat. However Offense, unlike Potency, is a stat you can never have too much of. A focus from secondary stats on Offense and Critical Chance, and possibly a Triangle with a Critical Damage primary, can help that stacking Offense hit harder and harder. But make sure not to put too much emphasis on CC as the Lord of the Sith leader ability means Sith Empire allies gain 10% CC for each of their own debuffs. Finally additional survivability, ideally in the form of Health, is the best route for keeping Darth Revan alive given mirror matches will see the other Darth Revan with 100% Defense Penetration, thus making additional Defense less valuable. In-game Mod Recommendations: Offense & Critical Chance. I do not have a major disagreement here other than the Speed set is so incredibly necessary to compete for #1 in the Squad Arena. So while yes, Offense and CC are going to boost Darth Revan’s kit, if your Darth Revan is 270 Speed and mine is 300, all of that Offense and CC will do you no good after I have killed your DR off. Be the first to comment on "SWGoH: Best Mods for Darth Revan"